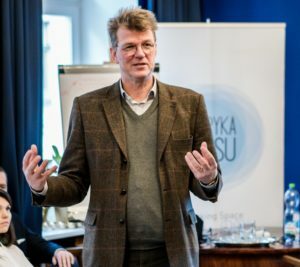 The Lecture by Prof. Göran Bolin (Södertörn University, Stockholm, Sweden), Member of Academia Europaea, took place during the Summer School on Democracy: Media, Information Literacy and Populism 17 – 28. June 2018, organized by the Institute of Political Science of the University of Wrocław. When it comes to the relation between digital media practices and civic engagement, much research has focused on protest movements (e.g. Occupy Wall Street and similar phenomena) and mass civic upheavals against authoritarian regimes (e.g. the Arab Spring). A much less focussed set of practices are related to the everyday, mundane and banal engagement in issues of less dramatic proportions, and with closer affinities to the lifeworld of citizens. In late modern, mediatized societies with decreasing voter turnout and party affiliations, there is a strong need to discuss the role of digital media in everyday civic engagement. Drawing on research carried out on the civic practices among citizen media users in Estonia and Bulgaria, this lecture accounted for and theorise some of these practices with a specific focus on their role in the mediatization of civic culture. A specific focus was put on which competencies and literacies are activated in civic agency. The lecture was a part of the Summer School, the program of which can be found here. The lecture was financed by the resources granted to AE by Riksbankens Jubileumsfond. Göran Bolin is professor in Media & Communication Studies at Södertörn University, Stockholm, Sweden. His present research interests are focussed on the relations between media production and consumption, especially in the wake of digitisation and datafication. Bolin has since the early 1990s worked in or headed research projects on violence in the media, youth and cultural production, entertainment television and the relation between production practices and textual expressions, media consumption and the production of value in cultural industries, mobile phone use, media generations, etc. His publications include Value and the Media: Cultural Production and Consumption in Digital Markets (Ashgate, 2011) and Media Generations: Experience, Identity and Mediatised Social Change (Routledge 2016) and the edited volume Cultural Technologies. The Shaping of Culture in Media and Society (Routledge, 2012). His most recent project is Nation Branding: The Nation as Community and Commodity in Eastern Europe (Baltic Sea Foundation, 2013-2017). He is a member of Academia Europaea, where he serves on the section committee for the section Film, Media and Visual Studies.